Last night was the final of the 2018 SME Buckinghamshire Business Awards. We were nominated for two awards, business of the year greater than 50 employees and high growth business of the year. We’re proud to say that we were successful in winning both of these categories. 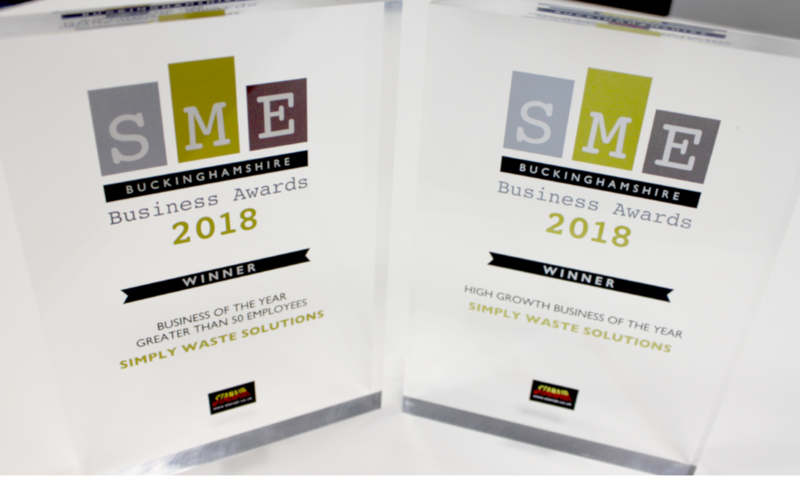 Five Simply Waste representatives attended the awards ceremony, it was fantastic to be in attendance to accept these awards that acknowledge the growth we’re taking as a business. The business is evolving at a rapid rate and there certainly is an exciting future ahead for Simply Waste Solutions. These awards highlight the continued hard work and dedication of our employees. It is our people that define us as a business and as such it is to them, that the plaudits for our successes must go.